Huda's Skyline, A social Sculpture at Dhaka Bangladesh, by SHATOTTO - ArchitectureLive! The project by SHATOTTO is situated at North-East facing corner plot in the posh residential area, Gulshan, Dhaka. Since the sun goes towards south in winter, so any construction will cast shadow in the northern part. While designing we calculated how much sun we receive from the east during summer and also winter and decided to create a double height entry space on the eastern side. From where in the morning, low angle winter light can enter to the northern part lawn area. So we justify the lawn in the corner of the road. Which is also visible from the street and contributing to the society as a green space utilizing the trees along the site. Big existing trees along with the site acted as a part of the landscape of our building. We also utilize the trees and green open space of mosque opposite to the north side and also the big trees as an extension of our landscape complementing each other. The use of glass boundary wall further dissolving the periphery of the plot while developing and organizing the layers of city landscape. 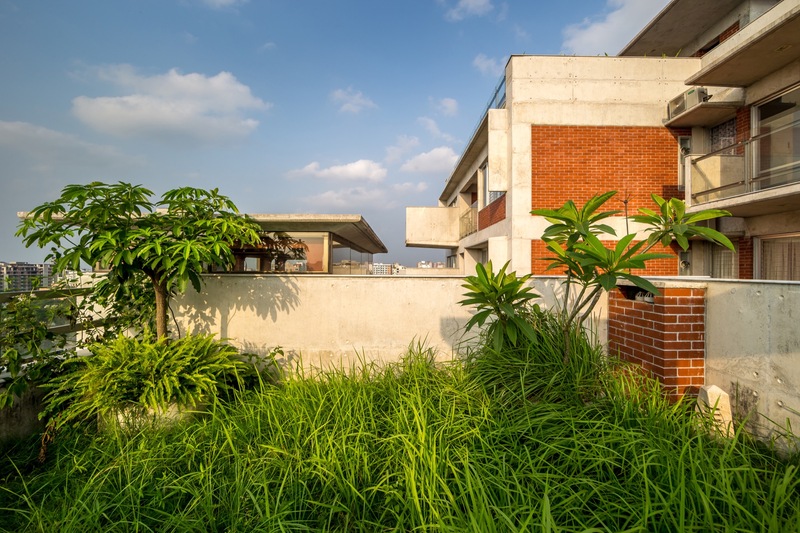 We placed in the southern part’s ground level a water body and greeneries as extension of the northern lawn up to the end of the south boundary wall through the glass room which is being used as reception lounge. So from the south end wall to the north end glass wall to the north road up to the mosque landscape is all through open. So, the whole site basically is a part of the landscape on the ground floor and became a continuous landscape. 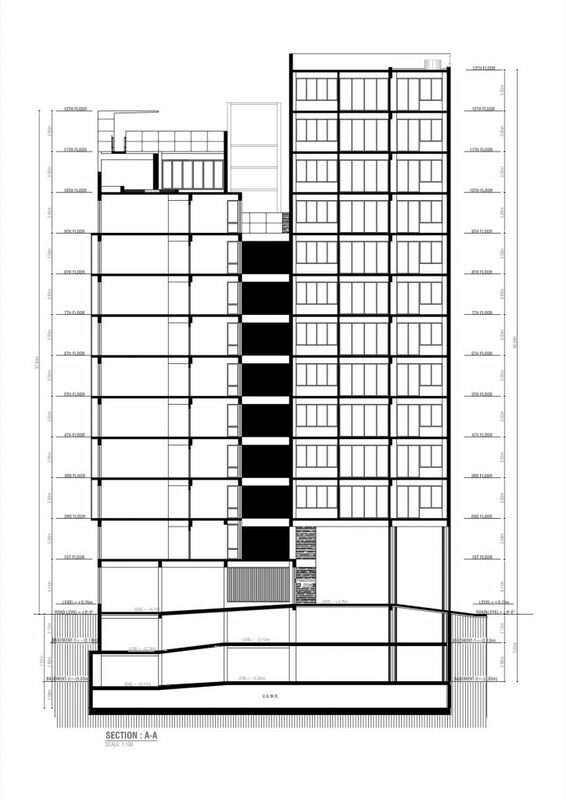 Originally the program given to us was flat twelve storied apartment building consisted of 23 apartments. Taking the advantage of 150 feet height limitation, we reorganized the skyline of the building. 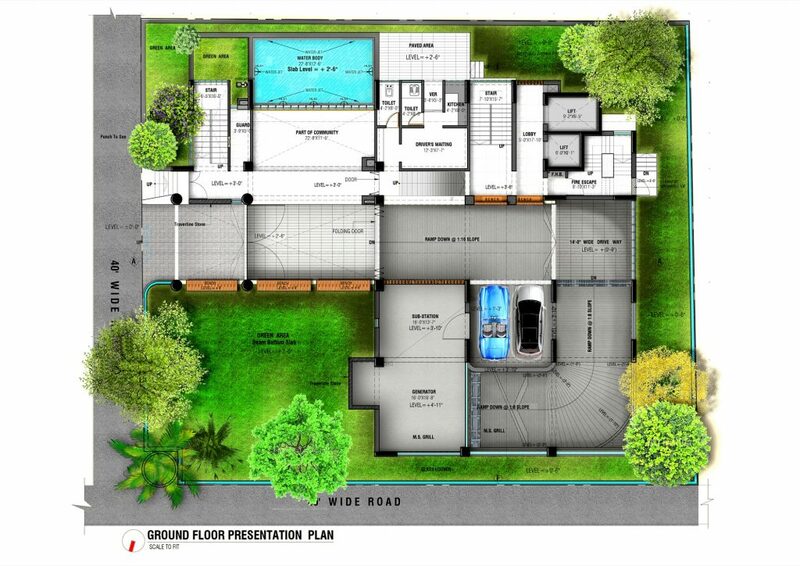 We generated new duplex, triplex, roof top gym and gardens. The idea was simple, the building like a social sculpture grounded on an appropriate city landscape.